I have been thinking a lot about how complex the overall HR technology landscape has become in the last five years. Traditional time and attendance vendors now do all things (Kronos ), applicant tracking vendors now do performance management (take your pick of vendors), learning management vendors now do compensation (Plateau ) and competitors are now the same organisation (Micropay and WageEasy ). This doesn’t even start to look at the large ERP’s trying to play in the 50 – 100 person marketplace! It is not difficult for an organisation with 1,000 plus employees in Australia to still have a maze of systems and dataflows, check out this example I pulled together today. Yes the flows miss performance and development data but I ran out of room and time to clearly demonstrate. 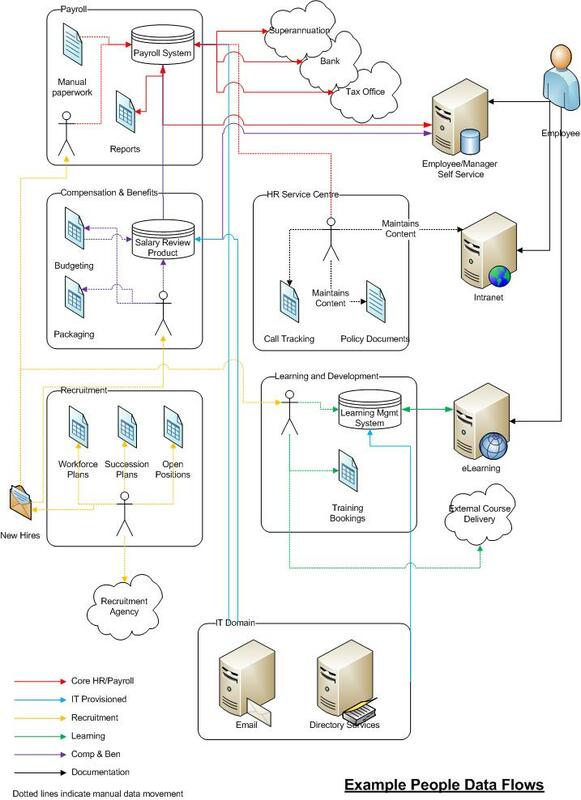 Nor I am saying that every organisation is like this, or heavens forbid that this is any target architecture! More that if you were to sit down with the HR and Payroll team in many midsized organisations in Australia you would end up with a maze of some sort. Very few have a clean architecture. So it is not surprising when we start to ask questions about workforce analytics, integrated talent planning, sources of hire etc a majority of HR departments just roll their eyes. They have no way of knowing how to get this data! What is your master data strategy? What are your data standards with regard to people data? Which system(s) is the source of truth? How to communicate data with external providers? How many different vendor’s tools do you have? The answers are usually not surprising, but they are not good either. However the challenge is not just to purchase a system that provides a nice integrated framework. That bit is easy! The hard part is part data conversion, cultural change, process re-engineering and IT development. To get a master data strategy you need everyone to agree on data standards and ownership, only then can one begin to assess the conversion/cleansing/migration effort to get to the new world. To reduce the data flows you need to have a clear picture of who is using your data, and now just officially using it. How many spreadsheets are manually loaded into other systems? How many IT developed interfaces exist to manipulate and represent your data to email, finance, facilities management systems? Who’s data fiefdoms are you going to destroy in the process? How many forms need to be changed? How many processes need stream lining and upgrading? It is never as simple as just installing a new payroll or talent management system. Posted on March 19, 2010 by Michael SpechtPosted in HRISTagged cultural change, data conversion, data flow, data management, Kronos, Micropay, Plateau, process re-engineering, Talent Management, WageEasy, workforce analytics, Workforce Planning.